In a sand quarry for cultivation of fish are used not only fish ponds, and other water bodies of artificial origin, in particular sand-pits. 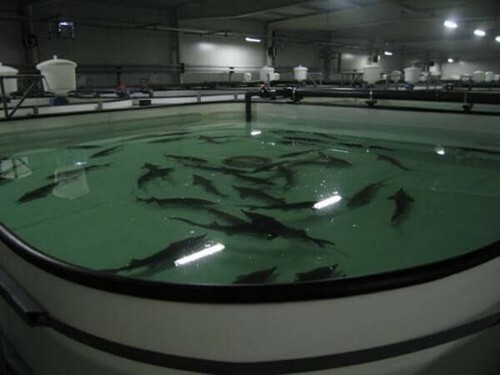 The hydrochemical regime of these water bodies in many respects more favorable for breeding fish than in peat quarries, and reservoirs of complex purpose and even in ponds full-cycle fish farms. Water in the sand pits is cleaner, and contains more oxygen. That’s why they can grow the fish species that are more demanding of hydrochemical regime, including Peled. The following describes the experience of Mature individuals Peled in the career of Constantine Kalinin region. It is known that the formation of breeding stock of this species in ponds is associated with frequent transfers fixation and livestock producers from summer ponds to Zimbali and back, as it causes trauma and a big waste of fish. About 6 km from the city of Kalinin, near the village of Konstantinov, for a number of years mined sand. On the spot developments have formed the quarry area of about 90 hectares, filled with water. Juvenile Peled in this quarry planted when sand extraction was still going on due to the irregularity of the bottom of the Seine refused, as he dug in the sand. It was therefore decided to apply the fixed network in the period of pre-spawning concentrations Peled and collect the eggs, picking the fish from the nets. Caught it in November with nets with a mesh of 40-45-50 mm. 8 days in his career was captured about 4 thousand copies. Peled. If at the beginning of the spawning season, an average of one entangling net was 16-17, in the end, only 4-5 pieces of fish. Due to the cold snap, December 2, fishing was stopped. There were 29.2 million pieces of eggs. The collection of caviar in 1982 favored weather conditions (air temperature was 2°, of water — 1.5 to 2°). 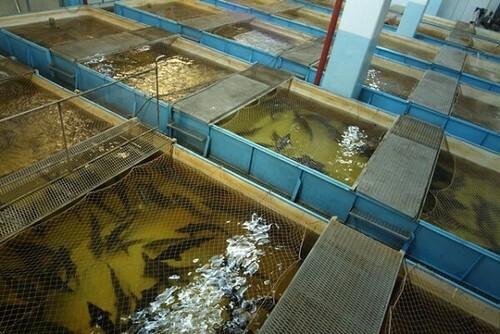 Shipping fish in open water to CADCAM took no more than 1 h. Eggs from 539 females were taken immediately after harvest. Planted to Mature specimens a few days after harvest were also ready to spawn. To capture the calf used 1367, or 87 % of females. In addition to Peled, in his career was caught several specimens of other species of fish: pike, perch, roach, IDE, Chub, carp and even pike Apparently, they were caught in the Volga river and released in the quarry anglers. Unauthorized moving fish passed spontaneously. Therefore, their number in 1978 was negligible. However, predators destroyed before released to the quarry larvae Peled. Only stocking segoletki allowed to grow in it, Mature Peled. This example clearly shows how harmful natural stocking of ponds. And the appearance in them of predators such as pike and perch, causing a sharp reduction in the number of species, not to mention competition from roach and carp in the use of fodder. In General, the experience shows that in the sand pits to grow marketable fish and producers of valuable species.